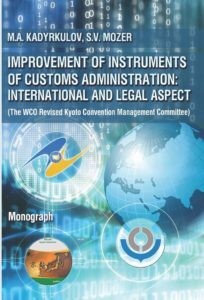 In October 2018, it has been published a monograph «Improvement of instruments of customs administration: international and legal aspect (The Revised Kyoto Convention Management Committee)». The authors of the monograph are Mukai Kadyrkulov, Member of the Board (Minister) for Customs Cooperation of the Eurasian Economic Commission, and Sergei Mozer, Deputy Head of Division of Advanced Customs Technologies, Department of Customs Legislation of the Eurasian Economic Commission. The monograph presents historical and modern facts of the World Customs Organization’s activities in terms of improving customs regulation and revision of the International Convention on the Simplification and Harmonization of Customs Procedures (Kyoto Convention).It analyzes some aspects of the forthcoming work on the updating of the Kyoto Convention by the international customs community. It considers the possible directions of mutually beneficial customs cooperation between the World Customs Organization as an international institution for the development and improvement of customs administration and the Eurasian Economic Commission as a permanent regulatory body of the Eurasian Economic Union (EEU). On November 15, 2018 the monograph and the methodological approaches for the revision of the Kyoto Convention were presented at the WCO Headquarters in Brussels on the 19th meeting of the Revised Kyoto Convention Management Committee. The results of the study aroused the interest of the international customs community (read the presentation). To read the monograph, please, follow the link.